Making mixes for my friends has to be one of my favorite time-wasting activities ever. I also really enjoy making the covers by hand, even though I have all the digital capabilities to make a professional looking cover. It's just way funner to break out the glue sticks and colored paper. The first cover I made for my friend Becky in Tennessee, for her birthday on Valentines day. 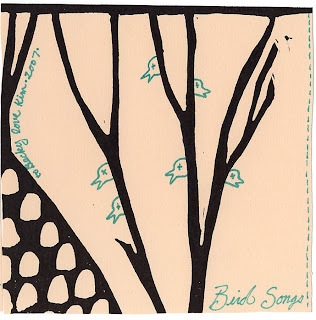 All the songs are about birds, or have birds in the titles somehow. The paper is a scrap of a print I made. The second is just a mix of all Decemberists songs from their various albums and EP's. 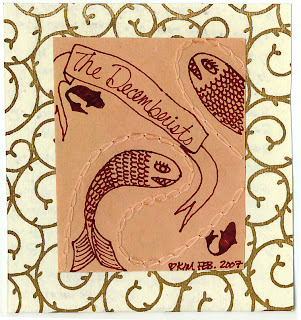 It's for my friend Kari who has (somehow) not heard the Decemberists until very recently, and wanted to hear more. I'm glad I made this because I rediscovered how great The Tain album is. If you like the Decemberists, and haven't heard this, you really need to check it out. It's a five song suite based on cycles in Celtic mythology. So beautiful!